Our thanks to all of our Exhibit Contributors, Financial Supporters, and of course, our narrators, Bobby Ocean and Charlie Van Dyke. Without help from all of our friends, this Special, and for that matter, the REELRADIO website, would not have been possible. THE LINK ABOVE REQUIRES YOU INSTALL REAL PLAYER ON YOUR COMPUTER. PLEASE USE THE LINK ON OUR TECHNICAL SUPPORT PAGE. MOBILE SERVICE ON APPLE DEVICES REQUIRES STREAMS APP. MOBILE SERVICE SHOULD WORK WITHOUT APP ON ANDROID DEVICES. If you don't want to install Real Player, or you don't want to purchase the StreamS app for your iPhone or iPad, this link will allow you to listen to our Tenth Birthday Special if Flash is installed on your computer. However, this option is not available for the regular exhibits on our site. It's for the presentation of this demo, only.
. . . Tina Delgado's still alive! . 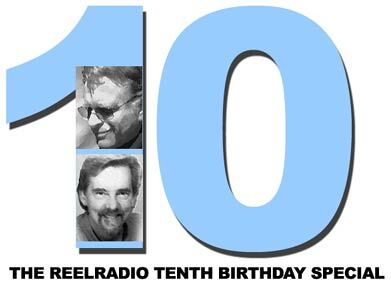 . .
Top 40 Veterans Bobby Ocean and Charlie Van Dyke host this 65-minute special created for the tenth birthday of REELRADIO on February 12, 2006. It features samples of all REELRADIO HITBOUND exhibits for each birthday, beginning in 1996 and continuing through 2005. Over 200 exhibitors have built the Repository via their Collections and Golden Gifts. If you are trying to listen to REELRADIO for the first time, please take note of these TECHNICAL ISSUES. You must have Real Player installed on your system to listen to REELRADIO exhibits. Please read our audio information page. ATT/SBC and other DSL providers may have issues with passing RTSP (real time streaming protocol) resulting in time-outs after a few minutes of play. If you have this problem, you can configure your player for HTTP transport and files will play through without timing-out. Please read Top Technical Issues on our audio information page. REELRADIO Terms of Service specify that we provide STREAMING, not downloading, and attempting to copy REELRADIO files may result in your IP address being blocked. Specifically, our software may block addresses that make multiple connections ("download accelerators"). We may also block addresses that repeatedly transfer multiple exhibits in less time than it takes to listen to the exhibit(s). We welcome listeners, not downloaders. Please read our audio information page. regarding multiple connections to a single IP address. Gordon K. Hahn, Kevin Gershan and Brandon Castillo, The Michael Hagerty Collection, The Marty Johnson Collection, Media Preservation Foundation, Richard Fatherley and The Dave Saviet Collection, The Don Kent Collection, Dan Haber's Bob James Collection, Jerry Lewine, Elizabeth McLeod and Radio Historian Jim Hilliker, The John Long Collection, The Bill Tash Collection, The Tim Benko "Windy City" Airchecks Collection, The Matt Seinberg Big Apple Airchecks Collection, The Don Jennett Collection, The Bill Hennes Collection, John Mehno and Ric Collins, Shaune Steele and The Real Don Steele Collection, The Rob Frankel Collection and The Uncle Ricky Collection. Thanks also to Norm Gilbert and Greg Argendeli for production elements. Special thanks to Ron Jacobs for his contributions to our organization. This feature is not intended to represent the full depth and variety of REELRADIO, but it is a fair sample of our first ten years, and what was "New" to our visitors on our birthdays. In 1996, when REELRADIO first went online, "someone else" paid all the costs of operation. As the site grew and we started featuring airchecks with music, voluntary contributions were insufficient, and a minimum annual subscription fee was introduced. Please note that we found it necessary to increase our minimum annual subscription since our Tenth Anniversary program was produced. As reflected in this presentation, it was $12 in 2006. In 2014, it was necessary to increase our new subscriber price to $20 and $15 for an annual renewal. As of 2016, we offer 6-month subscription terms at $10 for a new subscription, or renewal.